Preheat oven to 350F. Grease and flour a 12 cup muffin tray or line with muffin cups. Blend together bananas, milk, and olive oil until smooth using a blender, food processor or an immersion blender. In a separate large bowl mix together flours, 1/3 cup sugar, baking powder, baking soda, salt, cinnamon, and nutmeg with a wooden spoon. Add the blended ingredients to the bowl and mix again mix with a wooden spoon. Stir in diced apple and finely chopped walnuts. Evenly distribute muffin dough into muffin cups. Place 2 tablespoons sugar, walnuts, oats, and coconut oil in a food processor to make streusel topping. Pulse until there are no visible large walnut chunks. 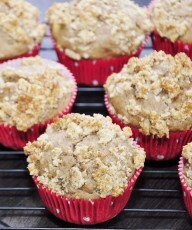 Crumble streusel topping over muffins. Bake in oven for 15 to 18 minutes. Remove from oven and allow to cool completely on wire rack. 1) Bananas need to be pureed until smooth. Leaving chunks of banana in the muffin dough will result in raw muffins.